Starting tonight, a segment of Rt. 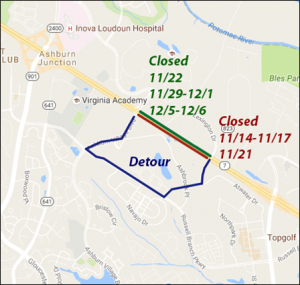 7 in Ashburn will be closed periodically overnight to accommodate construction of the Rt. 7/Ashburn Village Boulevard interchange. The closures of the highway will be between Ashburn Village Boulevard and Lexington Drive as construction crews move bridge girders into place. Traffic will be detoured onto a loop of Ashburn Village Boulevard, Russell Branch Parkway, Atwater Drive and Lexington Drive. Drivers should expect delays. on Tuesday, Nov. 22 and Tuesday, Nov. 29 through Thursday, Dec. 1 and Monday, Dec. 5 through Tuesday, Dec. 6 the westbound lanes will be closed. The Ashburn Village Boulevard interchange project is being built through a proffer by the developers of One Loudoun and is scheduled for completion in 2018.